There are 6 species of sloth split between two very different families: the three-fingered (Bradypodidae, genus: Bradypus) and the two-fingered (Megalonychidae, genus: Choloepus). 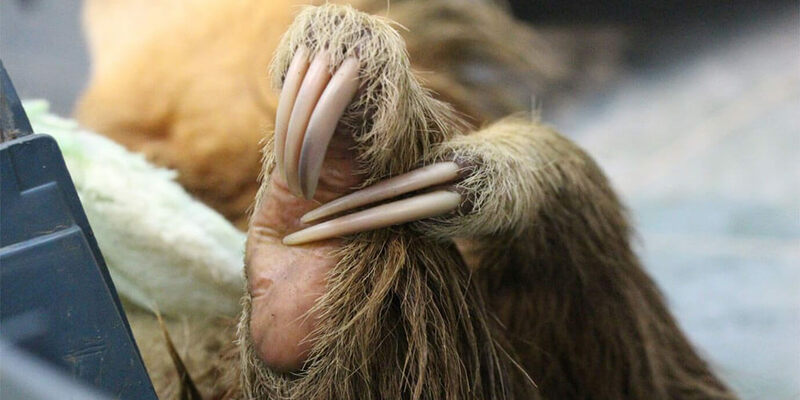 Although commonly referred to as three-toed and two-toed, all sloths actually have three toes; the true difference lies in the number of digits on the forelimb (the fingers).This is now recognized in numerous publications as the correct terminology for these animals. Although two-fingered and three-fingered sloths have remarkably similar lifestyles, recent research suggests that the two families are actually only distant relatives, adopting their upside-down arboreal lifestyles independently through a process of convergent evolution. Both the Bradypus and Choloepus tree sloths that we see today evolved from giant ground sloths, of which there were thought to be over 80 different genera with the largest (Megatherium) reaching over 6 meters in height. It is predicted that these gentle giants went extinct approximately 10,000 years ago due to an expanding population of human hunters. There is even evidence to suggest that several different species of marine sloth existed, feeding from sea grass and seaweed in shallow water. Together with armadillos and anteaters, both genera of sloth make up the ancient superorder Xenarthra. Due to a lack of evidence, it is unclear exactly when the different xenarthrans diverged, but morphological and molecular data suggest that the sloths and anteaters are more closely related to each other than they are to armadillos. Further molecular research has shown that the maned sloths (B. torquatus) split from the brown-throated (B. variegatus) and the pale-throated (B. tridactylus) sloths over 12 million years ago, with the latter two species diverging only 5-6 million years ago. 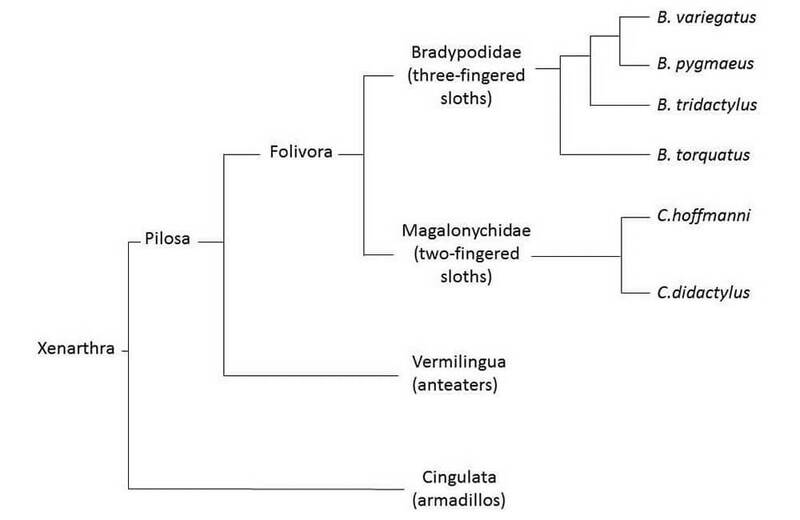 The Hoffmann’s (C. hoffmanni) and Linnaeus’s (C.didactylus) two-fingered sloths diverged approximately 6-7 million years ago. Although commonly grouped together, the two-fingered and three-fingered sloths are actually very different animals with very different lifestyles. These discrepancies can be seen in the biology, ecology and morphology of each genus. When you imagine a sloth, you probably think of a simple, lazy creature that does very little other than sleep all day. In fact, you might wonder how such an animal survives in the wild at all. Even the very name “sloth” in most languages translates as a version of lazy. 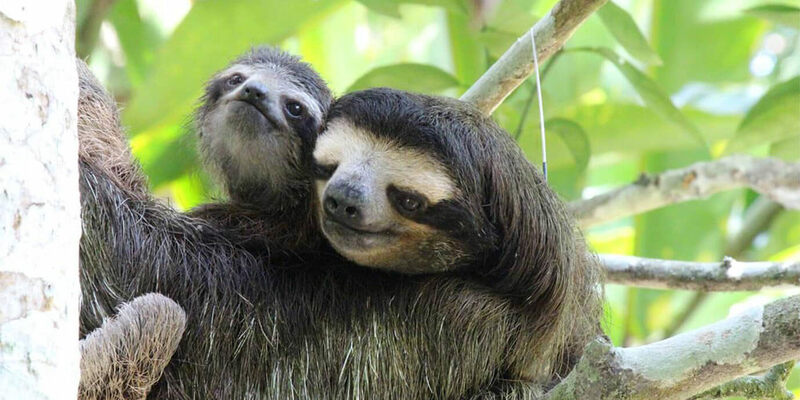 In 1749 when sloths were first described in the scientific literature they were labelled as “the lowest form of existence” – it is little surprising that sloths have been subject to such profound speculation and misinterpretation; “sloths are slow because they eat leaves that drug them”; “sloths are so stupid that they mistake their own arm for a tree branch and, grabbing it, fall”; “if you cut the head off a sloth, the heart will continue to beat for 15 minutes……”. We have heard it all. But what does it really mean to be a sloth? Why are they so slow? And why does it work? The answer is surprisingly simple: Being slow is an incredibly successful strategy for survival. In fact, being slow has helped sloths to survive on this planet for almost 64 million years. Sloths don’t actually sleep that much at all – research has shown that on average, wild sloths only sleep for 8-10 hours a day. In comparison, the similarly sized howler monkey sleeps for 15 hours a day, while koalas will regularly clock up 20 hours. Rather than sleeping all day, sloths just move at an incredibly slow and consistent pace. Due to a plethora of energy saving adaptations, sloths physically don’t have the ability to move very fast. They can’t run away from predators like a monkey would and instead, they have to rely on camouflage. The sloths main predators (big cats – Jaguars, Ocelots; and birds – Harpy Eagles) all primarily detect their prey visually, and it is likely that sloths move at a pace that simply goes unnoticed – sloths move slowly to avoid being identified as prey. They aren’t lazy, they are stealthy.